A pedestrian who was walking along U.S. Highway 101 north of Brinnon died after he was struck by a tractor-trailer. According to police, the pedestrian was apparently walking in the roadway. He was wearing a backpack that contained groceries and personal items. The collision happened just before midnight; the trucking crash is under investigation, but investigators do not believe that drugs or alcohol were a factor and have not told reporters that charges are being filed. A man from Everett died after he was hit by a passing minivan while walking along Highway 530 in Arlington. According to state police, witnesses had reported that a man wearing dark clothing was walking in the westbound lane of the highway prior to the crash. The driver of the minivan was not injured and had not been booked into custody, but the incident is being investigated as a possible vehicular homicide. A sample of the driver’s blood was taken for toxicology testing and the results are pending. A young man riding a bicycle on I-5 was struck and killed by a car near Ridgefield on Monday morning. The cyclist was apparently riding in the fast lane at 3 a.m. The driver left the scene, but later got in touch with police; he told officers that he did not have a cell phone and could not find an open business to place a call. Police closed several lanes of the highway to investigate the circumstances of the crash; they were not immediately able to identify the cyclist or explain why he had been biking in the fast lane. A 23-year-old driver who struck and killed a bicyclist is being held on $500,000 bail following his court hearing on Monday. Police believe that the killing was motivated by an argument that the killer and the cyclist had over a pair of sneakers. At least two vehicles chased the cyclist; one ran him over. The cyclist sustained blunt head injuries and died at the scene. The driver fled, but was found and taken into custody. One person was hospitalized after a rollover crash at 12th and Pike in Seattle. Firefighters responding to the early-morning crash were able to speak with the patient before extricating them. The Seattle Police Department is investigating the circumstances of the crash. A fire had to be put out and residents were evacuated after a truck carrying hazardous material crashed. The truck driver died in the collision. One Washington State Patrol officer was hospitalized for possible exposure to dangerous ammonia gas. An SUV got stuck on a stairway after its driver apparently got confused and turned down a pedestrian walkway in Queen Anne, thinking it was a street. The woman behind the wheel was arrested under suspicion of intoxicated driving. Residents say that poor signage is a well-known safety hazard in the area, where cars often speed through a nearby intersection, miss the “road ends” sign, and get stuck on the steep walkway. If you have been injured in a pedestrian collision, contact Davis Law Group. An officer with the Seattle Police Department was hospitalized after he was run over by his own car. 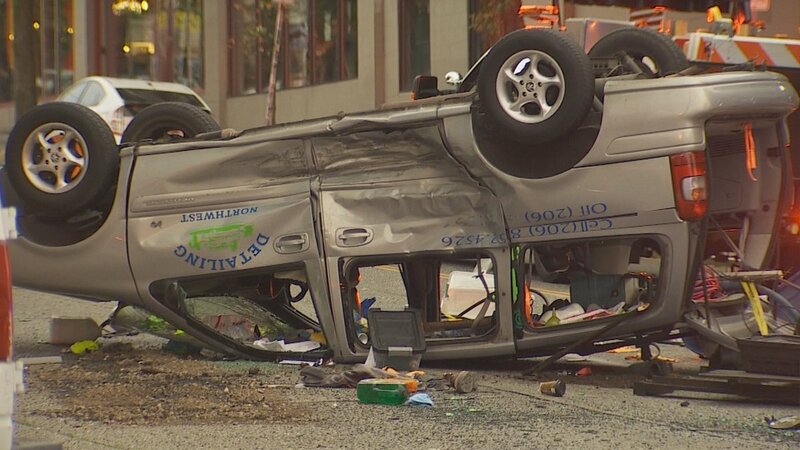 According to a witness, the officer had exited his vehicle in the Rainier Valley area when it rolled forward onto the officer’s leg. He was hospitalized with non-life-threatening injuries.